Welcome to Denver Colorado and the many rich and colorful suburban neighborhoods! Denver enjoys all four seasons with sunshine over 300 days per year. We invite you to browse our detailed catalog of Denver area neighborhoods and neighborhood map to learn more about the City of Denver. If you are coming to the Denver area in the near future and would like a free Denver driving map just fill out the form below and we will be pleased to mail one to you at our earliest opportunity. Alamo Placita’s formal flower gardens are one of Denver’s loveliest gardens. Both Speer Boulevard and Alamo Placita Park were added to the National Register of Historic Places and designated as official Denver Landmarks in 1986. View Alamo Placita homes for sale and read more about Alamo Placita real estate. Arthmar Park is a multi-cultural enclave that lies along the strip of Federal Boulevard, between West Alameda and West Mississippi Avenues, south of downtown Denver. Easy access to Interstate 25, puts the amenities and venues offered in Denver, just a little closer. View Athmar Park homes for sale and read more about Athmar Park real estate. The community of Auraria is located just east of downtown Denver, occupying a geographic triangle created by Cherry Creek’s west bank, the South Platte River’s east bank, and Colfax Avenue. Residents here enjoy the convenience of immediate access to I-25, light rail, and the distinct advantage of being part of Denver’s city center. View Auraria homes for sale and read more about Auraria real estate. Named for its proximity to Coors Field, the Ballpark real estate district has become a high-demand residential neighborhood adjacent to Downtown Denver, north of Denver’s Central business district, and generally considered to be bounded by 18th and Blake Streets, Broadway and the Central Platte Valley rail yards on the north. View Ballpark homes for sale and read more about Ballpark. The Baker Historic District, from 6th Avenue to Broadway, and Mississippi to the Platte River is a well-preserved middle class neighborhood developed during a 50-year span from the 1870s to the 1920s and is by all accounts, Denver’s oldest neighborhood. View Baker homes for sale and read more about Baker real estate. Phinius T. Barnum bought 760 acres of land in the Denver area in 1882, to use as a winter retreat when his circus wasn’t on tour. Named in his honor, this area is now called the Barnum neighborhood and is bounded by W 6th Ave to Alameda, and Federal Boulevard to Sheridan. View Barnum homes for sale and read more about Barnum real estate. The Bear Valley neighborhood is located on Denver’s west side, near the intersection of Highway 285 (Hampden Avenue) and Sheridan Boulevard. A quick ten-minute drive east of the Rockies, this is a residential neighborhood with a variety of apartments and modestly priced homes. View Bear Valley homes for sale and read more about Bear Valley real estate. Belcaro is a tranquil upscale neighborhood, bordered by Exposition Avenue, Colorado Boulevard, Tennessee Avenue, and Steele Street in Denver. 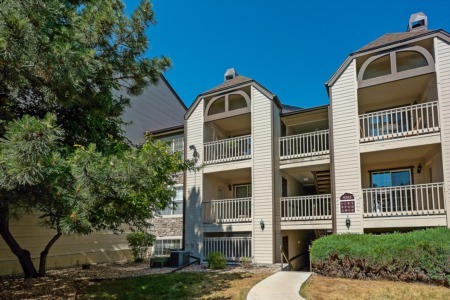 Conveniently located just south of Cherry Creek, Belcaro residents enjoy convenient access to I-25 from the Colorado Boulevard corridor. View Belcaro homes for sale and read more about Belcaro real estate. The area bounded by West 38th Avenue and Federal, and 52nd Avenue to Sheridan in northwest Denver, is the Berkeley neighborhood. Berkeley is the former home of Denver's favorite amusement park, Elitch Gardens. View Berkeley homes for sale and read more about Berkeley real estate. The real estate in Bonnie Brae is both historic as well as beautifully stately. You can find a number of home styles in this neighborhood, including brick ranch style homes, Cape Cods and even English Tudor style homes. View Bonnie Brae homes for sale and read more about Bonnie Brae real estate. Denver’s Capitol Hill neighborhood sits between Downing Street and North Broadway, and east Seventh Avenue, and Colfax. Several major streets pass though Capitol Hill, giving it the dubious distinction of being Denver's most densely populated neighborhood . View Capitol Hill homes for sale and read more about Capitol Hill real estate. Approximately 3,5000 residents, and countless visitors, inhabit the Central Business District. Often referred to as Upper Downtown, CBD stretches from Speer Boulevard to 20th Street and Broadway to Larimer Street. View Central Business District homes for sale and read more about CBD real estate. The area between 38th and 48th Avenues, and from Inca, to Tejon is home to the Chaffee Park real estate market. Situated on the northern edge of central Denver, Chaffee Park is one of the city’s older neighborhoods, recently emerged as an area rediscovered, by real estate clients. View Chaffee Park homes for sale and read more about Chaffee Park real estate. Cheesman Park, located at 8th Avenue and Franklin Street, is an 80-acre oasis that has been a part of Denver history for more than 100 years. This is one of Denver’s most picturesque locations, bordered on the north and east by residences, and on the west by the Botanic Gardens. View Cheesman Park homes for sale and read more about Cheesman Park real estate. Cherry Creek real estate is bounded by Cherry Creek itself on the south, East Sixth Avenue to the north, University Boulevard on the west, and Colorado Boulevard on the east. The neighborhood is generally located in the south-central area of the City of Denver and is a mixture of dense urban development and tree lined residential streets. View Cherry Creek homes for sale and read more about Cherry Creek real estate. Denver's City Park area is located just northeast of downtown Denver, south of 23rd Avenue to Colfax, and west of York Street to Colorado Boulevard. People are returning to the City Park real estate community because of its close proximity to the downtown area and the unique lifestyle it offers. View City Park homes for sale and read more about City Park real estate. Civic Center is located at the intersection of perhaps the best-known and most important streets in Denver, Colfax Avenue and Broadway. Its borders are defined as Bannock Street on the west, Lincoln Street on the east, Colfax Avenue on the north, and 14th Avenue on the south. View Civic Center homes for sale and read more about Civic Center real estate. Clayton Real Estate is located in northeast Denver, bounded by East 40th Ave to Martin Luther King Boulevard, and from Colorado Boulevard to York Street. As Denver Colorado's population started to really expand, early in the 1900s, Clayton, was the first of several nearby communities in northeast Denver, that actually started to be called suburbs of the city. View Clayton homes for sale and read more about Clayton real estate. Located just northeast of downtown Denver, bounded 44th Avenue on the north, East 32nd on the south, Downing on the west and York Street on the east, joined the city limits in 1874. Cole neighborhood residents work hard together, to preserve the architectural history and cultural diversity of this neighborhood. View Cole homes for sale and read more about Cole real estate. College View is a Denver neighborhood south of downtown. Its boundaries are Jewell Avenue, Zuni Street, Pecos, Dartmouth Avenue, and Federal Boulevard. There are several parks and open spaces here, and West Harvard Gulch and Dartmouth Gulch Park are the two largest. View College View homes for sale and read more about College View real estate. Located just north of the upscale Cherry Creek Shopping district, the Congress Park Real Estate area is bounded by Colfax to the north, 6th Avenue to the south, Colorado Boulevard to the east, and York Street to the west Only slightly further away are Downtown Denver, City Park, and the Museum of Nature and Science. View Congress Park homes for sale and read more about Congress Park real estate. Cory-Merrill real estate rests in a quiet, upscale residential community located just south of Bonnie Brae between Mississippi, I-25, Marion and Colorado Boulevard. Residents here are close to urban life, yet a feeling of “neighborhood” is sustained. View Cory-Merrill homes for sale and read more about Cory-Merrill real estate. Crestmoor Park is an upscale community located in southeast Denver, bounded by Holly St., Monaco Pkwy, 6th Ave. and Bayaud Ave. This is an older suburban-city neighborhood where civic and community pride is evidenced by large fashionable homes, and small mansions, surrounded by manicured lawns, with mature trees along quiet streets. View Crestmoor Park homes for sale and read more about Crestmoor Park real estate. Curtis Park neighborhood is emerging as an exciting and promising community just a 15-minute walk from Downtown Denver. This neighborhood is socially active and diverse; in a true spirit of social responsibility. The local community center and job-assistance programs work hard to improve lives and brighten the future. View Curtis Park homes for sale and read more about Curtis Park real estate. Denver Country Club real estate is one of Denver’s most exclusive neighborhoods. Shielded from busier districts by Speer Boulevard Parkway and Cherry Creek Bike Path, and the Seventh Avenue and Alamo Placitas historic districts, Denver Country Club is still only blocks from the Cherry Creek Shopping district and minutes from downtown. View Denver Country Club homes for sale and read more about Denver Country Club real estate. Building a sustainable community requires an holistic approach. There is always a long history of cooperation to be found in communities that create structures and lifestyles that remain, and prosper for generations. Downtown Denver real estate is such a community. View Downtown homes for sale and read more about Downtown real estate. The East 7th Avenue Historic district is Denver's largest community designated for historic preservation. The district runs from East 6th to East 8th Avenues and from Steele to Harrison Streets. 750 Lafayette Street was once the location of President Dwight D. Eisenhower’s wedding, as well as the working White House in the summers during his time in office. View 7th Avenue Historical District homes for sale and read more about 7th Avenue Historical District real estate. East Colfax Avenue, the main street that runs east and west through the Denver-Aurora metropolitan area, has had a long and storied history. The area began as a boulevard on the outskirts of town, lined with trees and wide promenades. View East Colfax homes for sale and read more about East Colfax real estate. Elyria-Swansea is located in north Denver, and is bounded by 52nd Avenue, Brighton Boulevard, and 54th Avenue on the north, by the South Platte River on the west, by 38th Street and 40th Avenue on the south, and by Colorado Boulevard on the east. View Elyria-Swansea homes for sale and read more about Elyria-Swansea real estate. Five Points is the name given to the confluence of 4 historic Denver neighborhoods that surround the intersection of Washington Street, 27th Street, 26th Avenue and Welton Street, northeast of Downtown Denver. View Five Points homes for sale and read more about Five Points real estate. The Fort Logan real estate district is a large collection of smaller communities that sit at the southwest corner of the Denver metropolitan area. Bordered roughly by Federal Blvd to Wadsworth and Highway 285 to highway 85 on the south, residents here enjoy quick access to Denver, and neighboring communities thanks to the major highways and boulevards that outline the neighborhood. View Fort Logan homes for sale and read more about Fort Logan real estate. Denver’s Gateway real estate district is a developing area northeast of downtown, located along the Pena Boulevard corridor between Denver International Airport and the Interstate, and boarded by East 56th Ave. and Tower Road, and East Chambers and I-70. View Gateway homes for sale and read more about Gateway real estate. Globeville real estate area is one of Denver’s oldest neighborhoods, located north of downtown, at the intersection of Interstates 25 and 70, making the neighborhood easily accessible to the rest of the Denver Metropolitan area, from any direction. View Globeville homes for sale and read more about Globeville real estate. The Golden Triangle district is situated on prime real estate, south of Downtown Denver. Formed by the gathering of Speer Boulevard, Colfax and Broadway, three of three of the city’s most important transportation corridors, the Golden Triangle is domicile to Denver’s finest museums and cultural institutions, not the least of which include the Denver Art Museum, the Denver Central Library, and the U.S. Mint. View Golden Triangle homes for sale and read more about Globeville real estate. The Goldsmith real estate area is situated between Evans Avenue, Yale Avenue, Quebec, and Interstate 25. Often referred to as “South East Denver”, Goldsmith has largely been a community of retirees, who have lived in the neighborhood for decades. View Goldsmith homes for sale and read more about Goldsmith real estate. Green Valley Ranch real estate can be found at the intersection of Tower Road and Green Valley Ranch Blvd, in a small valley just south of Denver International Airport. This Northeast Denver quadrant is one of Denver’s newer planned communities where residents enjoy a host of housing, retail, restaurant and state-of-the-art recreation facilities. View Green Valley Ranch homes for sale and read more about Green Valley Ranch real estate. The Hale real estate area is a dynamic, vibrant neighborhood just east of North Holly Street, with East Colfax Avenue, 6th Avenue Parkway, and Colorado Boulevard as its other borders. An exciting mix of housing, employment opportunities, neighborhood shopping and eating establishments best describes this post-WWII Community. View Hale homes for sale and read more about Hale real estate. Hampden real estate lies, northwest of the Cherry Creek Reservoir, in the far southeast portion of the Denver Metropolitan area, with East Cornell Avenue to East Girard Avenue and from South Geneva Street to Ulster Court, as its borders. View Hampden homes for sale and read more about Hampden real estate. Harvey Park real estate is a large residential neighborhood, located in southwest Denver, and bounded on the west by South Sheridan Boulevard, on the south by West Hampden (US 285), on the east by South Lowell Boulevard, and on the north by West Jewell Avenue. View Harvey Park homes for sale and read more about Harvey Park real estate. The Highlands real estate area is a northwest Denver community bordered by I-25 and Sheridan Blvd (East-West) and Colfax (15th Ave) to 52nd Ave (North-South). The Highlands gets it’s name, apparently, for its location above and to the west of the city of Denver prior to annexation at the turn of the last century. View Highlands homes for sale and read more about Highlands real estate. Hilltop real estate, one of Denver's most prestigious residential neighborhoods, is a beautiful tree- filled area, southeast of Downtown Denver, extending from Colorado Boulevard on the west, to Holly Street on the east, and from Eighth Avenue south, to Alameda. View Hilltop homes for sale and read more about Hilltop real estate. Indian Creek real estate, a relatively new community in Denver’s southeastern district, is located east of South Quebec Street, and south of East Florida Avenue. This small parcel of land in the southeast corner of Denver is convenient to downtown, Cherry Creek, and the Denver Tech Center. View Indian Creek homes for sale and read more about Indian Creek real estate. The Jefferson Park real estate area, perhaps Denver’s smallest, runs from I-25 to Federal Boulevard between Speer Boulevard and Colfax Avenue, and is named for the 7-acre park located on West 23rd avenue and Clay Street. View Jefferson Park homes for sale and read more about Jefferson Park real estate. Prospectors looking for gold, in the 1850’s, settled Lincoln Park real estate district, one of Denver’s oldest neighborhoods. Resting just south of today's Auraria Higher Education Center campus, and southwest of downtown, the area is bounded by 6th Avenue on the south, and West Colfax Avenue, and Speer Boulevard on the east, and the South Platte River. View Lincoln Park homes for sale and read more about Lower Downtown real estate. Lower Downtown real estate district, popularly referred to as “ LoDo”, is a 24-block area surrounding Denver’s Union Station. It extends from Wynkoop Street to Market Street on the southeast, and from 20th Street southwest to Speer Boulevard. This is the birthplace of Downtown Denver. View LoDo homes for sale and read more about LoDo real estate. Lowry real estate district is a modern upscale community located within the boundaries provided by Eleventh Avenue, Alameda, Yosemite and Monaco Parkway, in Denver. Within these boundaries, residents and visitors are invited to enjoy more than 800 acres of parks and recreation areas, from small neighborhood playgrounds scattered about, to larger more unique and picturesque green spaces. View Lowry homes for sale and read more about Lowry real estate. Mayfair real estate is a progressive neighborhood of modestly priced homes on Denver’s east side, about 5 miles from downtown. With Colfax Avenue, 6th Avenue, Monaco Parkway, and Colorado Boulevard as its borders, this almost entirely residential area is centrally located and residents need only travel short distances to neighborhood shops and businesses. View Mayfair homes for sale and read more about Mayfair real estate. Montbello is located quaintly between Stapleton and Green Vally Ranch in the northeast corner of Denver. Montbello is primarily comprised of residential real estate built in one time period built between 1970 and 1999 and generally considered to be established, but not old housing. View Montbello homes for sale and read more about Montbello real estate. In 1885 the Montclair Town and Improvement Company was formed, due east of downtown Denver, by a one Baron von Richthofen. The Baron decided that a refuge from early Denver's urban smog and congestion was needed. But early residents found jobs and services hard to come by. View Montclair homes for sale and read more about Montclair real estate. Anchored by the University of Denver on its west and South Colorado on its east, Observatory Park real estate, with its open green spaces and Romanesque telescopes, is the bright star in the University Park neighborhood, bordered by I-25 and Yale, Colorado and University Boulevards. View Observatory Park homes for sale and read more about Observatory Park real estate. Overland Park real estate district is bordered by West Mississippi Avenue on the north, South Broadway to the east, West Yale Avenue on the south, and the South Platte River to the west. This working-class neighborhood, home to Denver's first recorded settlement in 1858, is a collection of residential streets, active commercial districts and major industrial parks. View Overland Park homes for sale and read more about Overland Park real estate. The Park Hill North real estate district is enclosed by Colorado Boulevard on the west, with Quebec on the east, from 23rd Avenue north to 52nd street, and shares these boarders with the community of Northeast Park Hill. Park Hill North real estate has always been the most diverse set of communities in the Park Hill area, long symbols of the the classic middle-class neighborhood. View Park Hill North homes for sale and read more about Park Hill North real estate. Originally designed as a streetcar suburb for Denver’s more affluent families in the late 1800’s, Park Hill South real estate area is bounded by Colfax Avenue and Colorado Boulevard on the south and west, and Quebec Street and 23rd Street on the east and north. View Park Hill South homes for sale and read more about Park Hill South real estate. Colonel James H. Platt, civil war veteran and noted statesman from Virginia, was a vocal advocate for Colorado’s statehood in 1875. The vibrant and historic community given his name is located in South Denver, between Downing Street and South Broadway, and from Mississippi to Evans Avenue. View Platt Park homes for sale and read more about Platt Park real estate. Back at the turn of the last century 4 young millionaires joined together to purchase a 160-acre tract of land just south of Downtown Denver to hold their polo matches. Then in 1958, 34 acres of the property were sold and the Polo Club Place Subdivision was created. View Polo Club homes for sale and read more about Polo Club real estate. Call it industrial chic. Prospect Park real estate, a vibrant new community just north of downtown Denver was once wholly industrial, where warehouses and loading docks served the train traffic, and the hum of the rail yard meant progress. View Prospect Park homes for sale and read more about Prospect Park real estate. In the late 1800’s the real estate area now known as Regis, served as a gateway to the mountains, gold fields and trading routes west. Then in the early part of the twentieth century, Regis real estate was better known for its extensive parks, beautiful water district, and clean, fresh air. View Regis homes for sale and read more about Regis real estate. Situated in the Central Platt Valley District, Riverfront Park real estate gleams with the polish of contemporary architecture, and has quickly earned a reputation as Denver’s “Park Avenue”. Inspired by picturesque structures in the Vail Valley, Riverfront Park is lavish without pretension. Posh without apology. View Riverfront Park homes for sale and read more about Riverfront Park real estate. Within the boarders of the borders of Evans, Yale, Downing, and Broadway, just south of Denver we find the community of Rosedale. At the center of this quiet middle-class neighborhood is an area known as Harvard Gulch. View Rosedale homes for sale and read more about Rosedale real estate. Ruby Hill real estate is home to a small middle-class neighborhood, south of Downtown Denver along the Platt River. Major street routes such as Interstate 25, Mississippi Avenue, and Evans Avenue traverse the community. View Ruby Hill homes for sale and read more about Ruby Hill real estate. Located east of downtown and immediately north of City Park, the Skyland neighborhood contains primarily modest, well-kept homes exhibiting a variety of architectural styles. View Skyland homes for sale and read more about Skyland real estate. The 177-acre focal point of the Sloan Lake real estate area is Sloan Lake itself. Bordered by West 29th Avenue, West 10th Avenue, Federal Boulevard and Sheridan Boulevard, this picturesque residential neighborhood enjoys a rich history dating back more than a century. View Sloan Lake homes for sale and read more about Sloan Lake real estate. The Southmoor Park neighborhood, located just southeast of the intersection of Hampden Avenue and Monaco Parkway in southeast Denver and developed during the 1960’s and 1970’s combines the best of city conveniences and suburban life. View Southmoor Park homes for sale and read more about Southmoor real estate. The Speer real estate area, popularly known as Governor’s Park, is near the center of Metropolitan Denver, and is indeed anchored by the Governor’s mansion at 400 E. 8th Ave. The neighborhood is also referred to as Speer neighborhood because Speer Blvd. cuts through the center of the community, on a diagonal. View Speer/Governor's Park homes for sale and read more about Speer/Governor's Park real estate. Stapleton real estate is one of Denver’s most recent neighborhood creations. Built on the site of the former Stapleton International Airport, Stapleton is the largest urban redevelopment community in the nation. View Stapleton homes for sale and read more about Stapleton real estate. Sunnyside real estate is a large neighborhood. Its tree-lined streets and modest homes are part of the area traditionally called North Denver, bounded by Interstate 25 on the east, Interstate 70 on the north, Federal Boulevard on the West, and 38th Avenue on the south. View Sunnyside homes for sale and read more about Sunnyside real estate. Uptown real estate area, Denver’s oldest neighborhood sits just east of Downtown, and offers an appealing blend of charm and modern efficiency. Add to that an assortment of restaurants, retail, small office buildings historic mansions, entertainment venues and neighborhood gathering places, and you’ve got one of the city’s most popular neighborhoods. View Uptown homes for sale and read more about University real estate. Denver’s smallest new community is Union Station. This exciting, mixed-use area lies within a 6 block section of Downtown Denver, between between the Central Business District, and Highlands. View Union Station homes for sale and read more about Union Station real estate. The University neighborhood is home to the University of Denver, and it’s nationally recognized business and law schools. Interstate 25, and the city’s boundary with Englewood form the community’s northern and southern boarders, while University Boulevard and Downing Street define the east and west confines. View University homes for sale and read more about University real estate. I-25, Hampden, Colorado Blvd. and Evans bound the University Hills real estate area. So named for its proximity to the University of Denver, residents in this community enjoy the benefits, and certainly in many cases the nostalgia of a college town with coffee houses, shopping establishments, and an array of dining choices. View University Hills homes for sale and read more about University Hills real estate. Up until the 1950s, bucolic apple orchards and tranquil pastures of tall grasses dominated the area between Alameda, Cherry Creek North/ Mississippi, and Quebec. View Virginia Vale homes for sale and read more about Virginia Vale real estate. Virginia Village lies just east of downtown Denver; its boundaries are Mississippi Avenue, Evans, Cherry Creek South, and Colorado. This predominately residential neighborhood has ranch-style homes, high-rise condos, and apartments that provide a wide variety of housing for residents here. View Virginia Village homes for sale and read more about Virginia Village real estate. The Washington Park real estate district centers on one of Denver’s most beautiful parks. This small community of 7000 is one of the city’s finest and most prestigious neighborhoods. View Washington Park homes for sale and read more about Washington Park real estate. Wellshire real estate area rests inside the confines of Yale to Hampden and Colorado Boulevard to University Boulevard. Wellshire is one of Denver’s most peaceful and appealing new neighborhoods and historic older homes of strength and character line the streets of this quiet middle class community. View Wellshire homes for sale and read more about Wellshire real estate. Denver's historic Whittier Neighborhood located approximately 2 miles northeast of downtown Denver stretching from 23rd Avenue up to Martin Luther King Boulevard and across from Downing St to York St where it adjoins City Park. View Whittier homes for sale and read more about Whittier real estate. The lineup of established neighborhoods in every major city contains at least one small solitaire, a single gemstone that when examined, shines above all the rest. One such jewel in Denver’s community crown is Winston Downs. This small quiet middle class neighborhood is located between Monaco Pkwy on the West and Quebec St. View Winston Downs homes for sale and read more about Winston Downs real estate.